Excel formulas can do everything that a basic calculator can do, so if you’re in a hurry and don’t want to pull up the Windows Calculator application, you can enter a formula in Excel to get a quick result. Experimenting with this type of formula is a great way to get accustomed to formulas in general. Excel also has an advantage over some basic calculators (including the one in Windows): It easily does exponentiation. For example, if you want to calculate 5 to the 8th power, you would write it in Excel as =5^8. Just as in basic math, formulas are calculated by an order of precedence. The table lists the order. In this exercise, you learn how to enter some formulas that perform simple math calculations. Launch Excel if needed and open a new blank workbook. If you already have another workbook open, press Ctrl+N to create a new workbook. Click cell A1, type =2+2, and press Enter. The result of the formula appears in cell A1. 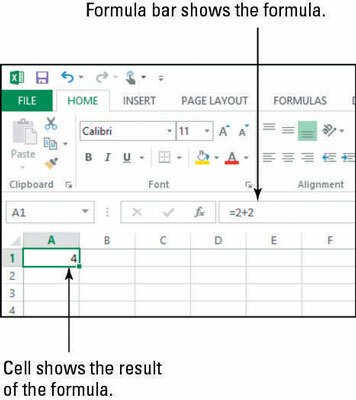 Click cell A1 again to move the cell cursor back to it; then look in the Formula bar. Notice that the formula you entered appears there, as shown in this figure. Click cell A2, type =2+4*3, and press Enter. The result of the formula appears in cell A2. In this case, because of the order of operations, the multiplication was done first (4 times 3 equals 12), and then 2 was added for a total of 14. 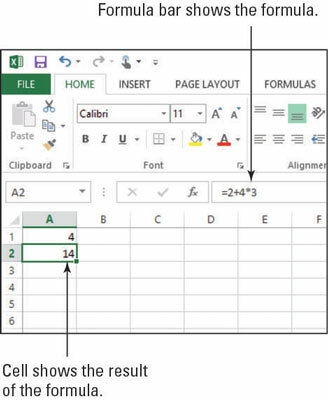 Press the up-arrow key once to move the cell cursor back to A2 and examine the formula in the formula bar. In cell A3, type =(2+4)*3 and press Enter. In this case, the parentheses forced the addition to occur first (2 plus 4 equals 6), and then 3 was multiplied for a total of 18. Press the up-arrow key once to move the cell cursor back to A3 and note the formula shown. Close the workbook without saving changes to it.